For adults traumatized by the prospect of going to the dentist, the idea of taking their precious child in can be a fearsome one. Still, the advice from experts is clear: Children should start seeing the dentist by the time their first teeth erupt – no later than their first birthday. According to a Colgate-sponsored study, more than one in four children in the United States have cavities by the time they are 4 years old, sometimes as early as age 2. Taking your child to the dentist for the first time doesn’t have to be a scary experience for either of you. “We don’t like to do anything other than look the first time around,” says Dr. Paul Engibous of Anchorage, whose pediatric dentistry practice regularly receives accolades as one of the city’s best. Most pediatric dentists won’t plan on doing anything invasive, like filling a cavity, on the first visit unless it’s an emergency. Kids often sit in parents’ laps while the dentist examines their teeth. What you can expect is a lot of talking. Dr. J. Brant Darby, an Anchorage pediatric dentist and the author of a book called “How to Successfully Prepare for Your Child’s First Dental Visit” (available on amazon.com), says that first dental visits include discussions on brushing, flossing, diet and fluorides. They might also include time spent talking about cavity risk factors and finger, thumb and pacifier sucking habits, among other topics. Many parents want to take their child to their own known, trusted dentist, but there’s a case for visiting a dentist who specializes in children. You should also visit the office to make sure you’re comfortable with staff and setup. This is also a good way to give children a sneak peek at where they’ll be going. Dentists’ offices, especially those that exclusively cater to children, may be equipped with extra child-friendly diversions like games and toys. They may also feature an open layout with dental chairs in a row. This setup decreases anxiety for children and parents because they can see what’s going on around them – unlike a doctor’s office, where each room is separate. Keep the focus on the fun part at the end: Many pediatric dentists offer a “grab bag” that includes dental hygiene-related loot as well as fun trinkets. 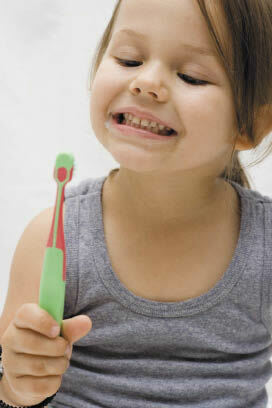 Dental health for children in the U.S. is on a worrying trajectory. According to a recent U.S. Centers for Disease Control and Prevention survey, cavities were more common among young children in the early 2000s than they were a decade earlier in the 1990s – despite advances in dental care and widespread fluoridation. Kids all have the potential to develop healthy teeth, but hygiene habits and diet make the difference, and that’s where parents come in. Getting parents involved is part of the rationale for early visits, says Engibous. He sees young children with tooth decay so severe that it’s visible not only to a dentist but to anyone. “A cascade of events can occur at a very, very young age,” he says. Cavities and other tooth problems are not only painful for small children, they can cause problems with eating and speaking. In rare cases, they can even lead to serious infections. That’s when the not-so-pleasant trips to the dentist begin. “We would like to focus completely on prevention but we have to do a lot of intervention,” says Engibous. Traumatic injuries caused by falls and other accidents are another major cause of childhood dental emergencies. Darby says he advises parents to take time to re-childproof their homes – accidents can often be prevented this way. “I just tell them to do it once a month – it just takes 20 or 30 minutes,” Darby says.